Earth horse number one was born on a small farm. His dam is a quiet family horse who has been a trusted mount for kids and is happy to walk along the trails or run speed events at the local playday. Earth horse number one has always been treated with love and respect. He has not had any formal training but is happy to wear a halter and lead. He picks up his feet to be trimmed and loads in the trailer. He is 3 now and it is time for him to learn to be ridden. Earth horse number one is sent to a local trainer to get started under saddle. Holding weight has never been a problem so he has been getting 2# a day of timothy grass pellets, grass hay and pasture. He also gets 1 tsp a day of a prebiotic/blue green algae supplement. 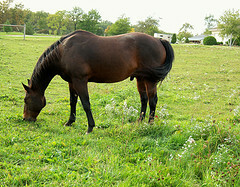 Since he won’t have any pasture at the trainer’s farm he has been started on 1/2 flake of alfalfa twice a day. On the day of the move to the trainer Earth horse number 1 is started on his Earth Horse balancing formula at 1 scoop a day just to support him. Earth horse number one is a bit concerned with being at a new place but he has food in his pen so he figures his world is ok. He doesn’t know anyone at the new barn but he is happy to make new friends. The next morning he gets his first training session. He is moved around a round pen then he gets a saddle on his back. It was pretty scary but his trainer helped him move his feet and get used to the feel of the cinch around his belly. Overall he feels like he did pretty well. He is glad to be back in his quiet pen to process the new information. Earth horse number one does great with his training. He is not the most athletic horse but he tries hard to do what is asked of him. He learns to walk, trot and lope both directions. He stops and turns well and is quiet out on trail rides. He goes back to his family so he can help his mom carry around the kids. Earth horse number 2 is also raised on a small farm. His dam was a very successful barrel racing horse. He is handled and taught to lead, pick up his feet and load in a trailer. He is fed a ration designed to support growth in young horses so he will build muscle and be ready to go into barrel race training as a 2 year old. He also gets grass and alfalfa hay. He gets pretty fat on this feeding program but his owner figures he will lose this extra weight when he starts in training. Early in his 2 year old year he starts in training. He is hauled to the trainer and put in a pen with several other horses. There is a good bit of competition for food so he ends up getting a kick on his hind leg. His leg hurts but at least he got his share of food. The next day he is run around a round pen and then gets a saddle put on. It is scary and he does not know what to think about it. He tries to buck it off but he can’t. He is run around until he quits bucking and then the saddle is removed. The next day the saddle is put back on and he doesn’t try to buck it off. He is ponied behind another horse out in the arena. He is glad to be with another horse and the older horse comforts him. After being ponied he is tied to the outside of the fence for a couple of hours. He is very uncomfortable in the heat with the saddle on his back and his extra weight makes him sweat more but he handles it. The next day he gets run saddled, run around, ponied and then ridden. By now he has seen enough to know what is expected of him. He is a good boy with his rider but his reward is 2 hours tied to the fence. Over the next few weeks Earth horse number one learns to walk, trot, lope, stop turn and circle around the barrels. Then he has to stand tied while other horses are worked. He would much rather be in his pen getting some hay. Eventually he is asked to go faster and faster around the barrels. He just does not understand why he is being asked to run with all his heart then slam on the brakes and turn the barrel only to have to run again. This work also makes his leg sore from when he was kicked. The stress and soreness is taking a toll on him and he has less energy to fight for his share of the food. His stomach hurts and he does not always feel like eating. Eventually he starts to protest when he is asked to run down the alley to the barrels. The trainer has a talk with his owner and tells her that Earth horse number 2 is lazy and hard headed. The trainer does not think he will be a great barrel horse like his dam. His owner decides to take him home and work with him herself. She decides it is not so important to have him go to futurity races if it is too much for him. Since he has lost weight and is tight around his stomach area his owner starts him on a natural product to help heal ulcers and the Earth balancing formula to help him relax. After a few months off Earth horse number 2 gets to start over with his person who loves him and cares how he feels. He is so excited to be home and he really wants to be a good barrel horse like his mom so he tries hard. Instead of the high grain feed he was on he now gets timothy pellets, grass and alfalfa hay, chia seeds and blue green algae. Earth horse number 2 is never as fast as his dam but he has many years of success in barrel racing. His hurt leg occasionally gets sore and when it does his person gives him AniMotion. He also gets his Earth balancing formula when he is on the road racing. He is a happy horse.